When the very last scene of M. Night Shyamalan’s Split – spoilers for those who still haven’t seen it – revealed that it was in the same universe as the filmmaker’s highly underrated 2000 movie Unbreakable, many became very excited about where things could lead from there. Sure enough, anticipation went through the roof when a follow-up was announced that would combine characters from both movies, and with Shyamalan in the midst of a minor career resurgence after a period of duds, there was hope that the director would finally break away from being the punchline he had become and get back to making legitimately good movies once more. However, it seems that Glass is already proving to be one of Shyamalan’s most divisive films, in the sense that most critics seem to rate it very poorly – at the time of this review, it has a meagre 36% score on Rotten Tomatoes – yet IMDb, which is where one usually finds a general audience reaction, currently has an average score of 7.5 out of 10. Online reactions also seems to suggest a leniency towards the film, with many saying it was mostly worth the wait and one of Shyamalan’s strongest films in years; however, that hasn’t stopped others from declaring the film a huge disappointment and an utter waste of time, especially for those who loved both Unbreakable and Split. I find myself in a position where I can understand both sides of the argument, but at the same time I may actually be one of the few critics who isn’t afraid to say that I actually rather admired this film, despite its glaring flaws. Taking place three weeks after the events of Split, Kevin Wendell Crumb (James McAvoy) – who inhabits several personalities due to his dissociative identity disorder, including the monstrous Beast – is still at large, but is located by vigilante David Dunn (Bruce Willis) who inhabits superhuman strength. However, both men are captured by the authorities and placed in a mental institution, where psychiatrist Dr. Ellie Staple (Sarah Paulson) tries to convince them that their superhuman abilities are merely a figment of their imagination. Also in the hospital is Elijah Price (Samuel L. Jackson), a brittle-boned former enemy of Dunn’s who goes by the name of Mr. Glass, and sets into motion a plan to escape the institution with the help of the Beast and reveal their superhuman existence to the world. It’s interesting that a sequel to a film considered to be one of the most grounded superhero films ever made is now being released in an era where superhero films are everywhere, which could explain the muted reaction to this film so far. Back in 2000, they were far and few in between with many of them not doing so well with critics or at the box office, so when a film like Unbreakable comes out that subverts expectations of this genre at the time, people are bound to take a little more notice. Nowadays, things are of course far more different for superhero movies, with the MCU still going strong and DC finally starting to get its act together, many of them sticking to a strong formula that has caused other comic-book films to adopt just to catch up. 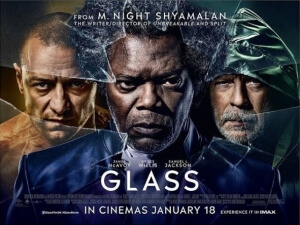 Glass, much like Unbreakable, doesn’t stick to this formula at all and just kind of does its own thing, in this case having most of the movie take place in the confines of a psychiatric ward and containing numerous dialogue scenes that attempt to deconstruct both previous movies in as well-rounded a manner as it can be. On the one hand, I get why most people seem to be disappointed by this approach, because to be treated to an extended therapy session after two films of building up these characters and their respective powers is kind of a cheat, especially to those who did want more of them butting heads with each other. On the other hand, I personally found myself very interested in what this movie did with such a well-known formula, and what they were all talking about – long-winded and repetitive though it can feel at times – I found to be a fascinating psycho-analysis of previous events from both Unbreakable and Split, which I felt to be a very brave departure from what most audiences may be expecting from this genre. I was never bored during this film, nor was I ever feeling like it was lacking in many departments, especially its acting. James McAvoy, much like how he was in Split, is worth the ticket price alone just for his utter commitment to these multiple personalities he has to bring life to; and although Bruce Willis and Samuel L. Jackson have significantly less showier moments than McAvoy, it’s nice to see them return to some of their best roles and feel like they never really left (Willis does seem to actually want to be there for a lot of it, unlike a lot of his recent, mostly direct-to-video work). I would actually say that this film is one of Shyamalan’s best-acted films, because there’s barely anyone in this cast who gives an awkward or lacklustre performance which seems to have been a staple for the filmmaker as of late (just look at Mark Wahlberg in The Happening), and in terms of Shyamalan’s other lesser tropes such as over-written dialogue and odd direction, it feels like there is significantly less of that here which makes for a slightly smoother watch; however, this being a Shyamalan film, it does contain a number of twists and turns, which are probably where the movie is going to be a deal-breaker for many, and I’d be lying if I said I didn’t understand why. At least one of these twists really doesn’t make a whole lot of sense, and does kind of come out of nowhere with barely any lead-up whatsoever, which does leave me wishing that the film was a little cleaner in how it wraps things up, but it just about makes up for it with a final twist that’s more fitting to this story. The movie is certainly not perfect, and as a conclusion to both Unbreakable and Split it’s easy to see why this would piss off so many audiences, but despite that I did enjoy this movie more than I thought I would, if only for its brave attempt to do something very different with the superhero genre at a time when it’s more popular than ever. Glass is an admirable, though most certainly not perfect, conclusion to M. Night Shyamalan’s Unbreakable and Split which will definitely divide most people, but contains enough interesting material to keep itself afloat just enough.